From top left to right: Afghan Air Force helicopter flies over Mazar-i-Sharif; Blue Mosque; View from Maulana Jalaludin Cultural Park; Industrial area. 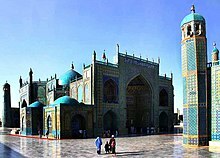 Mazār-i-Sharīf or Mazār-e Sharīf (Persian/Pashto: مزارِ شریف, ˌmæˈzɒːr ˌi ʃæˈriːf) is the fourth-largest city of Afghanistan. The population was about 375,000 as of 2006. It is the capital of Balkh province. It is linked by roads to Kunduz in the east, Kabul in the south-east, Herat to the west and Uzbekistan to the north. The city is a major tourist attraction in Afghanistan because of its famous shrines as well as the Muslim and Hellenistic archeological sites. In 2006, the discovery of new Hellenistic remains was announced. The region around Mazar-e-Sharif has been historically part of Greater Khorasan and was controlled by the Tahirids followed by the Saffarids, Samanids, Ghaznavids, Ghurids, Ilkhanates, Timurids, and Khanate of Bukhara. The name Mazar-e-Sharif means "Noble Shrine". This name represents the Blue Mosque which is widely known to be the grave of Hazrat Ali (prophet Mohammad's son-in-law). The city and region became part of the Afghan Durrani Empire around 1750. Mazar-e Sharif remained peaceful for the next one hundred years. In 1979 then neighboring Soviet Union invaded Afghanistan. During the 1980s Soviet war, Mazari Sharif was a strategic base for the Soviet Army. Between May and July 1997, the Taliban unsuccessfully attempted to take Mazar. About 3,000 Taliban soldiers were killed by Abdul Malik and his Shia followers. The Taliban returned on August 8, 1998 and led a six-day killing frenzy of Hazaras. Soon after, the city was occupied and taken over by the Taliban. 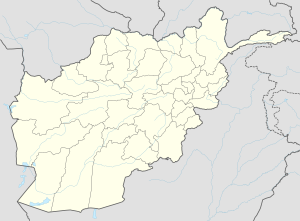 Following 9/11, Mazar Sharif was the first Afghan city to fall to the Northern Alliance (United Front). The Taliban's defeat in Mazar quickly turned into defeat from the rest of the north and west of Afghanistan. On November 9, 2001 the city was captured by the Afghan Northern Alliance forces after the Battle of Mazar e Sharif with help from the United States Special Operations Forces and bombing by U.S. Air Force aircraft. As many as 2,000 Taliban fighters who surrendered were reportedly massacred by the Northern Alliance after the battle. Reports also place U.S. ground troops at the scene of the massacre. There are also NATO peacekeeping forces in and around the city providing assistance to the Afghan government. On April 1, 2011, as many as ten foreign employees working for United Nations Assistance Mission in Afghanistan (UNAMA) were killed by angry demonstrators in the city. The demonstration was organized in retaliation to the March 21 Qur'an-burning in Florida, United States. The climate in Mazari Sharif is very hot during the summer. Daily temperatures are over 40°C or 104 degree Fahrenheit in June and July. The winters are cold with temperatures falling below freezing. Young children are photographed while ISAF troops from Norway patrol the streets in 2009. The population of Mazari Sharif is around 375,000. It is a multiethnic and multilingual society. The main language in Mazari Sharif is Dari (Persian) followed by Pashto. Both are the official languages of Afghanistan. The city is a centre for the traditional buzkashi sport, and the Blue Mosque is the focus of Afghanistan's Nawroz celebration. Mazar-e Sharif serves as the major trading center in northern Afghanistan. It was the first city to connect itself by rail with a neighboring country. The rail service from Mazar-e Sharif to Uzbekistan began in 2011 and is expected to rapidly boost the economy of the city. Cargo on freight trains arrives to the last station near Mazar-i-Sharif Airport, where the goods are reloaded onto trucks or airplanes and sent to their last destinations across Afghanistan. The local economy is mainly trade, agriculture and karakul production. Some oil and gas have also boosted the city's economy. The modern city of Mazar-i Sharif is centered around the Shrine of Hazrat Ali. Much restored, it is one of Afghanistan's most glorious monuments. Outside Mazar-i Sharif lies the ancient city of Balkh. ↑ 1.0 1.1 "The State of Afghan Cities Report 2015". Archived from the original on 31 October 2015. Retrieved 21 October 2015. ↑ "Balkh Monument". BBC Persian. Retrieved 2011-04-01. ↑ "Afghan powerbrokers: Who's who". BBC News. November 19, 2001. Retrieved 2011-04-01. ↑ "Afghan railway: First train runs on new line in north". BBC News. December 21, 2011. Dupree, Nancy Hatch (1977): An Historical Guide to Afghanistan. 1st Edition: 1970. 2nd Edition. Revised and Enlarged. Afghan Tourist Organization. This page was last changed on 14 February 2019, at 13:49.